We’ve probably all seen a television show or movie depicting a character involved in a auto accident and, in an attempt to receive greater money from insurance or a lawsuit, they claim to have suffered a painful neck injury. While these characters are designed to exaggerate the effects of the accident for financial benefit, neck injuries after an auto accident are not at all uncommon. In fact, over 90% of auto accident victims report neck pain to some extent, making neck injuries the most common symptom after an auto accident. Additionally, neck injuries resulting from auto accidents can have long-lasting effects for the person or persons involved in the accident. The occurrence of neck injuries after an auto accident (usually) has nothing to do with financial greed but rather stems from the physics of what happens to your body during an accident. When you are involved in an accident, your car is often coming to an abrupt stop as it collides with another car, a pole, or whatever the object may be. As this abrupt stop occurs, your body moves forward and is then thrown back with the seat while your head lags behind. This jerking motion is often generally referred to as “whiplash” but can lead to more than one type of injury. This instance of your head and body moving in different directions, makes your neck vulnerable to strains and sprains. However, it can also lead to more serious injuries such as torn ligaments and discs in the neck. These injuries can lead to pain, swelling, and the buildup of scar tissue in the neck. Furthermore, these injuries are not always a short-term ordeal for many victims. 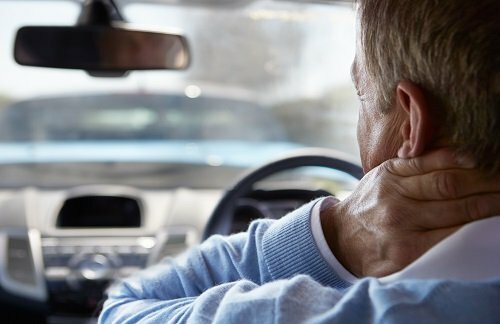 A recent research study has found that about 20% of auto accident victims may suffer neck pain symptoms for up to 10 years after the accident. However, there may be help available for those involved in an auto accident. Studies show that chiropractic care has been found to improve range of motion in the neck, reduce the buildup of scar tissue, and prevent the development of chronic pain. The sooner you can start treatment following the accident, the more effective the treatment can be in returning you to a pain-free daily life. Don’t live with debilitating neck pain when there is help available to help you get back to being pain-free. If you or someone you know has been experiencing neck pain following involvement in an auto accident, give Advanced Chiropractic & Rehab a call today at (330) 726-7404 to schedule a free consultation to see how we can help. We have been servicing the Youngstown and Mahoning Valley area since 2001 with convenient locations in Boardman and Hubbard. At Advanced Chiropractic & Rehab, we are a multi-disciplinary rehabilitation group that treats work comp injuries, whiplash, sports injuries and specializes in much more than just low back pain.